When it comes to democratic societies, where voting is an affirmation of one’s freedom and equality, and is the cornerstone of democracy, the freedom to abstain from making a choice is often missing. Citizens are given the freedom to vote for any candidate standing for elections, but few democracies give voters the explicit right to reject all the candidates, if they find no one suitable. In effect, citizens are given the freedom to choose but not to withhold making a choice.When a consumer goes to the market to buy vegetables, he checks out different shops to compare prices and quality. He is free to buy from the shop he finds most suitable, or walk away from the market if the prices or quality do not suit him. Imagine if the consumer did not have the right to reject all the vendors and was compelled to shop and make a purchase. It would not be a pleasant shopping experience and the consumer may decide not to visit that market again. This much-used but little noticed freedom to not make a choice is a significant one. It protects consumers from having to make a selection when no suitable options exist. When it comes to democratic societies, where voting is an affirmation of one’s freedom and equality, and is the cornerstone of democracy, this freedom to abstain from making a choice is often missing. Citizens are given the freedom to vote for any candidate standing for elections, but few democracies give voters the explicit right to reject all the candidates, if they find no one suitable. In effect, citizens are given the freedom to choose but not to withhold making a choice. Some countries allow voters to scratch the ballots, or select more than one candidate, or cross out names on the ballot, to invalidate their votes. Voters may also decide to not participate in the elections so that their votes do not go to any of the unsuitable candidates. But these options limit the participation of voters in democratic processes. Not voting means reneging on the civil duty to vote and have one’s voice counted. And it is the candidates with tainted backgrounds, rather than citizens with right to vote, who should abstain from participating in elections. In India, the freedom to reject all the candidates has eluded voters since independence. They have not been given the right to withhold consent. While Section 49 (O) of the Conduct of Election Rules 1961 gave citizens the right to vote for no candidate, the voters could not do so in secrecy. They had to inform the election officer, fill a form and cast their votes on separate ballots, which violated their right to vote secretly. With the coming of electronic voting machines (EVMs), it was not even possible for voters to invalidate their votes by scratching out ballots or voting for two candidates. The only way to ensure that the vote is not wasted on an undeserving candidate was to not participate in the elections. As a result, Indian democracy has suffered from lower voting turnouts and growing dissatisfaction with the quality of candidates contesting elections. In the 2009 general elections, only 58% of registered voters cast their ballots, as against a high of 63% a quarter of a century ago. 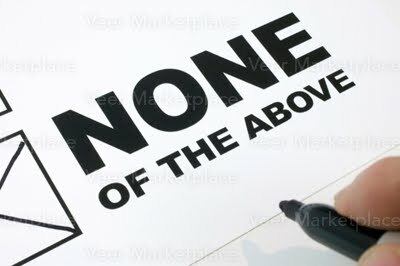 However, Indian voters going to the polls now have a new choice available to them: “none of the above (NOTA)”. The Supreme Court of India in its judgment dated 27th September 2013, (People’s Union for Civil Liberties and another Vs. the Union of India) directed the Elections Commission to add an extra button on the electronic voting machines for “none of the above”. NOTA gives voters the option to not vote for any candidate listed on the ballot if they find all of them unsuitable. And the votes received under NOTA will get counted and posted with the election results. The voters will not have to stand out of elections or invalidate their votes, or vote reluctantly to reject candidates. This ruling allowing for an extra button may seem to be a small development, but it is not. The fact that it took over 12 years for NOTA to come into practice means there must be something potent about it which all political parties feared and resisted, while those outside of the political circles fully supported. If a large number of people in a given constituency vote for “none of the above” then it sends a clear message to all political parties that the electorate does not find candidates fielded by them suitable, and rejects the brand of dirty politics practiced by them. NOTA may also encourage more citizens to participate in elections as they can vote and have their votes counted, even if they did not select any candidate. It allows them to fulfill their civic responsibility with a clean conscience. India may have a multi-party democratic system. But one thing that voters find in common to all parties is the overarching role of crime, connections and money. Increasing criminalisation of politics, corruption, and rampant abuse of money has become the new normal. Nearly a third of Member of Parliaments (MPs) in India face criminal charges. In Uttar Pradesh, 47% of the Members of Legislative Assembly (MLAs) have criminal charges against them, while in Bihar the corresponding figure is 58%. All political parties notionally agree that people with criminal records should not contest elections. In practice, they collectively resist any attempts to enforce this, be it through NOTA, the Lokpal bill or the Supreme Court ruling which disqualifies any politician convicted for crimes punishable with more than two years in jail. There is a vicious circle where political parties claim that it is the voters who elect these tainted candidates, whereas the voters claim that in the absence of NOTA, they do not have any real choice and have to vote for candidates or political parties they believe to be less tainted than the others. The coming of the NOTA option has the potential to put some cracks in this vicious circle. NOTA is an outcome of frustration citizens have felt with the criminalisation and corruption of politics. They have seen candidates winning elections and amassing huge amount of personal wealth, clout and assets, and using it to stay in power, with no benefits to the common person. And candidates with criminal backgrounds have an upper hand in winning elections as they have illicit funds to campaign and to buy votes, and have no hesitation in using physical force and coercion to change voting patterns in their favour. NOTA is a positive step in making democracy more inclusive and providing space for all views. It provides a way to reflect the anger and frustration with dirty politics felt on the street onto the ballots. And it a useful barometer to gauge how closely the views of people about candidates contesting elections match with those of the political parties that field them. But NOTA does not go far enough. It provides a reflection of the views of the people but fails to provide solutions and alternatives. It does not give people the right to reject candidates, and disallow them from contesting and winning the election. In fact, NOTA has no impact on electoral outcomes. Even when a majority of people vote for NOTA and reject all candidates, the winning candidate will still emerge from the rejected candidates. This is because NOTA has been given no teeth – it cannot lead to cancellation of polls or re-elections, or force political parties to present a new selection of candidates. The will of the people will remain curtailed as voters have to accept the situation where the winning candidate may have more votes rejecting him than those selecting him. Incidentally, NOTA may also end up reducing the number of deciding votes in an election – that is votes which are used to decide the winning candidate. As NOTA votes have no impact on the election results, when a large number of people reject all the tainted candidates, it is the small number of votes polled in favour of these candidates that will determine the winner. Thus there is a high possibility that NOTA will not end up giving the politics we want and the tensions between the people and the political class will remain. The anger on the street has to find its way to ballot boxes in a more decisive manner. This can happen if NOTA results are legislatively linked to election outcomes in some ways, either through calling of fresh elections or revisiting how to tally votes put in by voters, or by banning rejected candidates and political parties. Expecting political parties whose candidates have been rejected because they were tainted, or had criminal backgrounds, to take moral responsibility and voluntarily recall these candidates is not a possibility. If political parties had any moral backbone they would not field such candidates, or aggressively defend their rights to do so. NOTA is just one among a series of efforts being made to restore power to the people. It is an outcome of gradual awakening of the Indian electorate brought about by new tools, movements and laws. In 2003, the Supreme Court required that candidates disclose their criminal histories. In 2004 the non-governmental organization, People’s Union for Civil Liberties (PUCL) filed a public interest litigation calling for voters to be given the right to negative voting. In 2012 the anti-corruption movement galvanised by the social activist Anna Hazare and his team turned into a series of protests and demonstrations all over India, and received national and worldwide media coverage. It brought millions of youths to the streets, aided by the ubiquitous use of mobile phones, traditional media and social networks. Their demand calling for passage of the Janlokpal bill to root out corruption in government bodies became the clarion call of the masses. While the bill has still not become the law, it has raised awareness among the public on the need to establish and enforce stronger laws against political corruption. It has also proved the power of public organization and non-violent dissent. In 2013, the Supreme Court barred lawmakers convicted of serious crimes from serving in national and state legislatures, even if the conviction was being appealed. The year also saw the transformation of the anti-corruption movement into a new political party – the Aam Aadmi Party (AAP) which aims to provide an alternative to the dirty politics that surrounds the voters. The party is at a nascent stage and has yet to contest its first election and prove its mettle. But formation of this new party, the first political start-up in the mobile and digital era, is a welcome development. We need more of these homegrown political start-ups and political innovations to shake the status quo and provide more suitable alternatives to the people. People want to ensure that the candidates they elect to public positions are there to serve them, and not to make servants out of the public. The sanctity of politics as the most devoted form of public service has to be restored. There will be opposition from vested interests and those within political circles, but we have reached that unfortunate stage in India where people have to be protected from their elected representatives so that they do not plunder all the national wealth, ruin the economic, social and political fabric of the country, and suppress the voices of dissent while holding on to power and filling their pockets through criminal and corrupt means. Our democratic institutions need to constantly change to reflect the aspirations and demands of the people, and needs of society. Candidates and political parties contesting elections need to develop greater accountability and respect for the people they represent and the fear that the voters will not hesitate to reject and recall all of them should they become tainted or deviate from the path of public service. And if cleaning the politics requires total rethink and reform of our electoral structures, then so be it, and it is time to start the process. The ticket to entry into politics should not be being born in a dynasty, being a scion of a politician, being corrupt or a criminal. We need to open up and professionalize the political sector, making it easier for youngsters and professionals to participate in it. Let thousands of new political start-ups bloom, powered by the vision to build the nation, the determination to serve the people, and the courage to stay truthful and not waver from this path. Resources, training and mentorship should be made available to encourage such start-ups to challenge the existing political structures which have failed the people. This will encourage honest and sincere candidates to enter politics knowing that voters want clean and nation-building politics, and that they have the tools to reject tainted candidates.